Federal, state and local law enforcement cracked down Wednesday on 83 members and associates of the Mexican Mafia, accused of drug running in the Los Angeles County Jail system. The suspects were charged under racketeering indictments known as the Racketeer Influenced and Corrupt Organizations Act (RICO). It's the same tool prosecutors used against members of the Mafia in the 1970s. It alleges drug smuggling, "widespread extortion," assaults, and money laundering. Thirty five of the 83 defendants are already in custody in state prison or county jails. Sixteen others are fugitives still being sought by police. 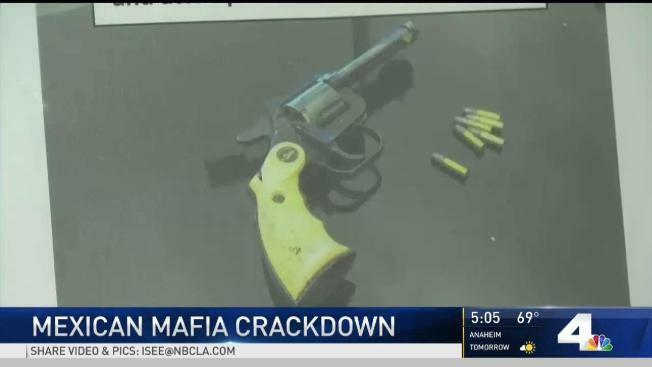 "These cases have delivered a major blow to the Mexican Mafia and leaders of many of the street gangs under the control of the organization," said United States Attorney Nick Hanna in a statement. "By taking out the gang members who control the jails, and by disrupting their communications network, we undermined the Mexican Mafia's ability to coordinate street gang activity." Paul Delacourt, the Assistant Director in Charge of the FBI's Los Angeles Field Offic, said gang violence in the jails impacts what happens on the streets. "This three-year investigation focused on players at all levels for their role in the conspiracy — from the shot-caller, to the secretary, to the dealer, to the smuggler," he said. The indictment focuses on a time when reputed Mexican Mafia member Jose Landa-Rodriguez and two other members of the prison gang, now dead, allegedly controlled the criminal enterprise at the jail system, authorities said. According to the indictment, Landa-Rodriquez, 55, orchestrated murders, assaults, and the kidnapping and murder of the relative of a gang member who authorities said had defied him. A second suspect, identified as Luis Vega, 33, allegedly ordered a murder and directed assaults against those who "showed disrespect" or "failed to follow Mexican Mafia rules." Gabriel Zendejas-Chavez, an attorney for Landa-Rodriguez, is accused of traveling to state and federal prisons with messages with the names of people potentially cooperating with police and plotting a $100,000 extortion from the Mongols outlaw motorcycle gang. Attorneys are valuable to the Mexican Mafia because attorney-client privilege can serve as a shield to conceal criminal activity from law enforcement, officials said. Michael "Pomona Mike" Lerma, 61, allegedly extorted drug proceeds from Latino street gangs in and around Pomona, and inmates at Calipatria State Prison in Imperial County, officials said. Lerma profited when top-level female associates known as "señoras" put money into his prison account, according to the indictment. The indictment also alleges Lerna's associates shot a man who refused to give them a Mercedes-Benz owned by an inmate in the LA County Jail. Authorities said they disrupted a murder after learning about a woman being kidnapped and extorted.